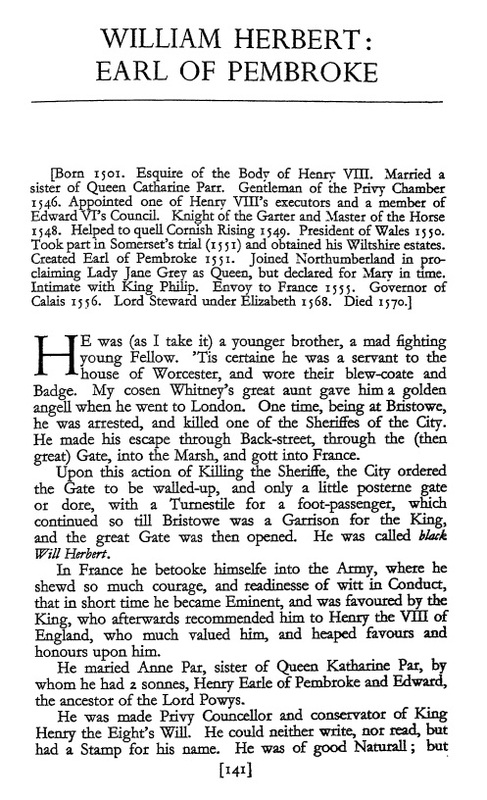 1st Earl of Pembroke in [Aubrey's "Brief Lives"]. 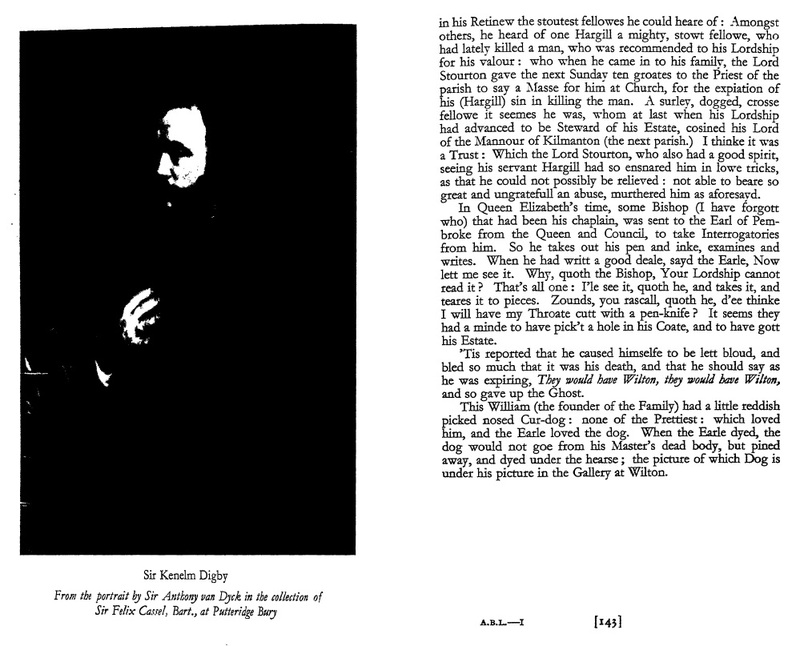 See pages 141 and 142 and 143 of 1950 edn. Survey of the lands of William, 1st Earl of Pembroke, Charles R. Straton, 1909, 2 vols. [NA.UK] RR. 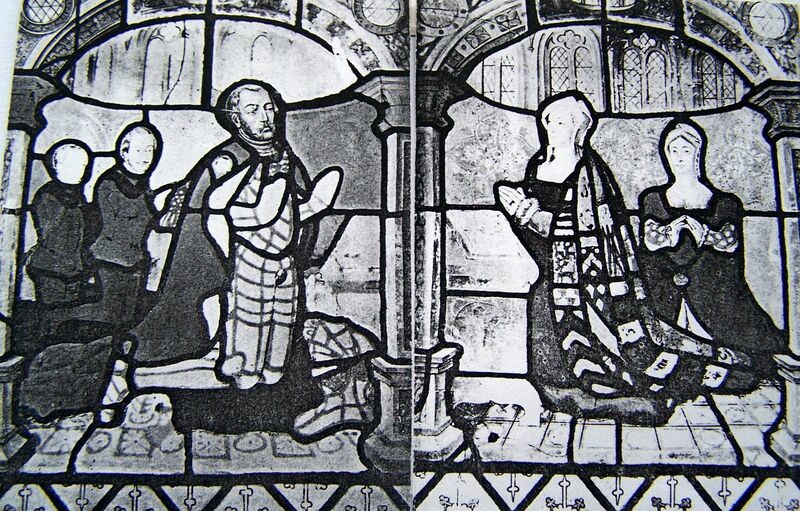 Old Herbert Papers at Powis Castle and in the British Museum (1886). 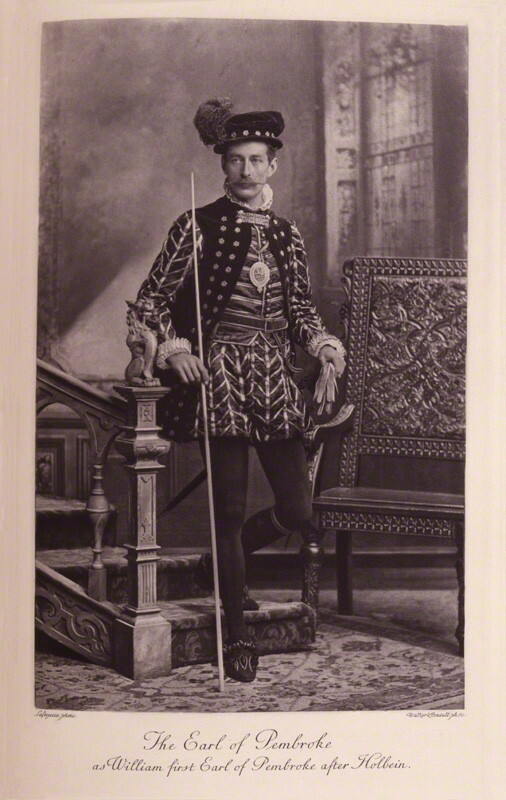 William Herbert, 1st Earl of Pembroke. Portrait 1567. See full size. From here. See other version from Tudor Place. 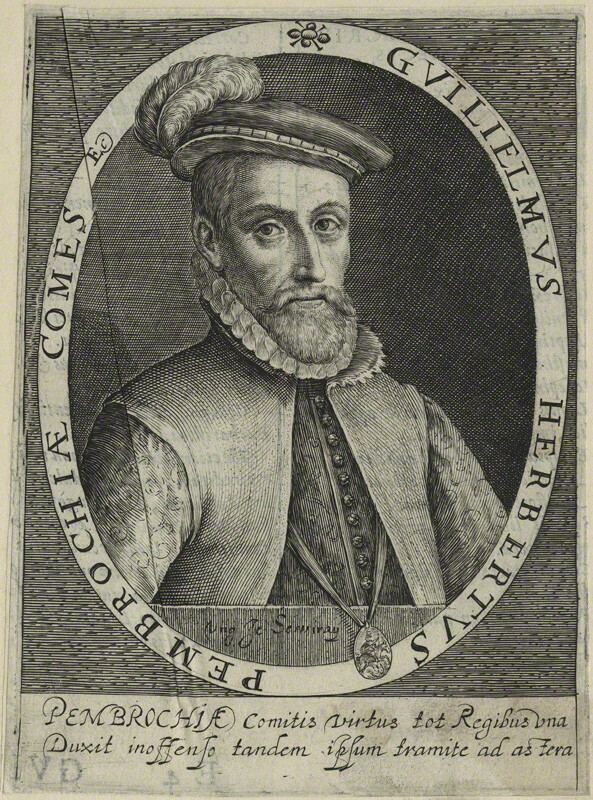 William Herbert, 1st Earl of Pembroke (see here and here), born 1506. He killed a man in a brawl in Bristol, escaped to France. 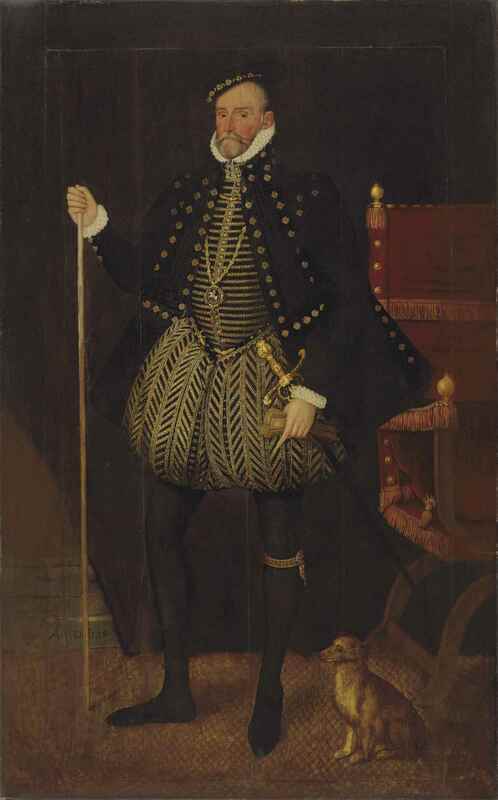 Later returned to England. He mar 1stly to Anne Parr [born 1514, descendant of Edward III, sister of Catherine Parr]. 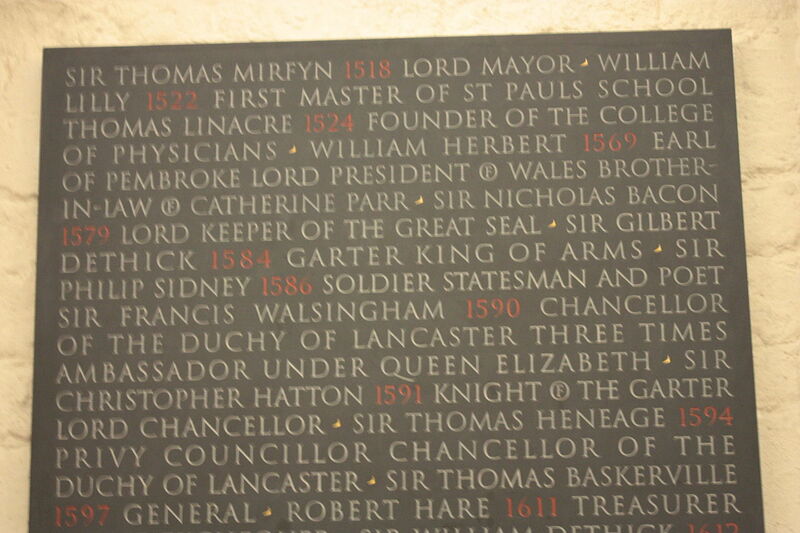 He rose with the Parrs when Catherine married Henry VIII 1543. Granted Wilton Abbey and lands by Henry VIII by 1544. He pulled down Wilton Abbey. Built the first Wilton House in 1540s. 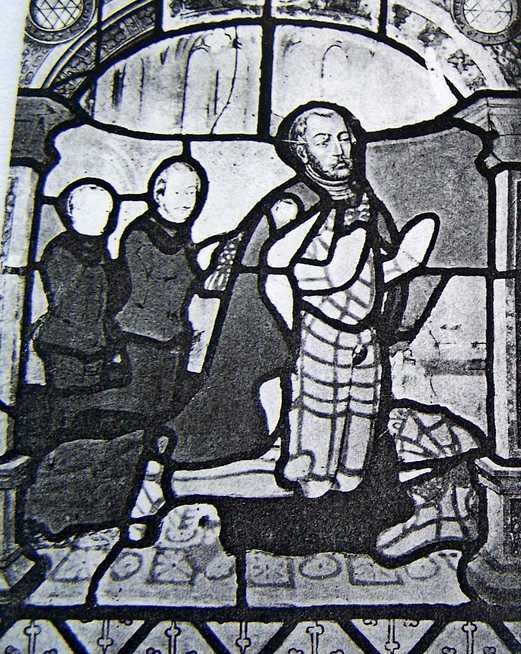 He was a guardian of the young Edward VI after death of Henry VIII 1547. He was cr 1st Earl of Pembroke by Edward VI 1551, by the influence of his fellow Protestant John Dudley, Duke of Northumberland. In 1551 he was granted the massive Baynard's Castle in central London. bur in the old St.Paul's Cathedral, London. The 1st Earl married his son to Lady Catherine Grey 1553, while Dudley married his son to Lady Jane Grey, and tried to make her Queen. 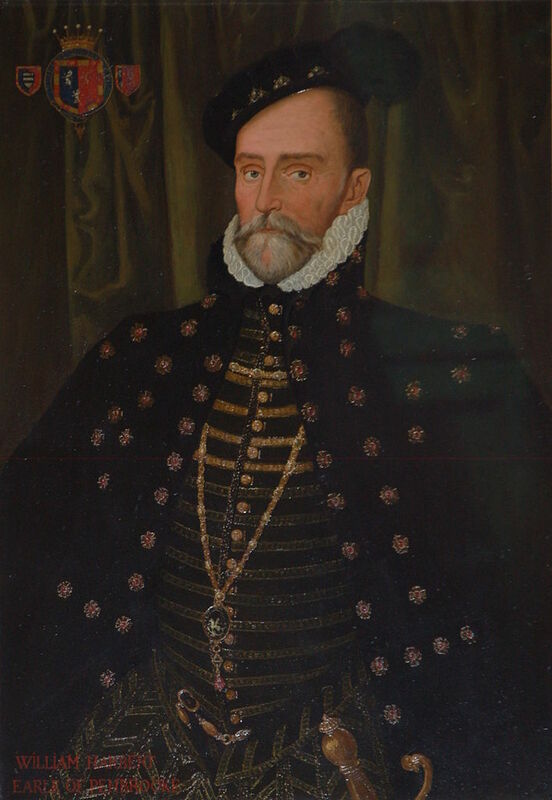 He mar 2ndly, post-1552, to Anne Talbot [born 18 March 1523, dau of George Talbot, 4th Earl of Shrewsbury]. 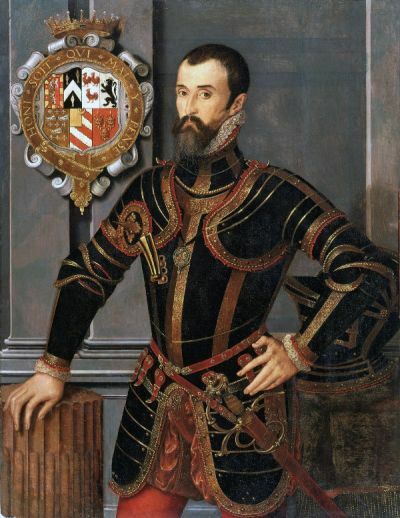 He died at Hampton Court, 17th Mar 1570, age 64 yrs. He was bur in the old St.Paul's Cathedral, London. 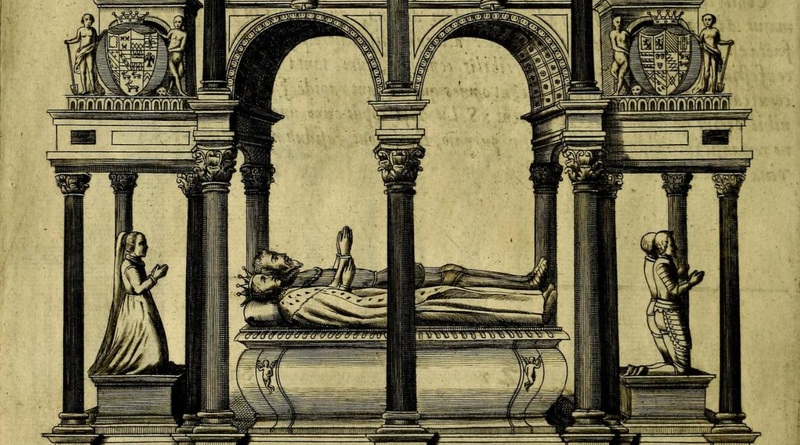 Anne Talbot died 18 July 1588, age 65 yrs, bur 8 Aug 1588.
see discussion in [Complete Peerage]. 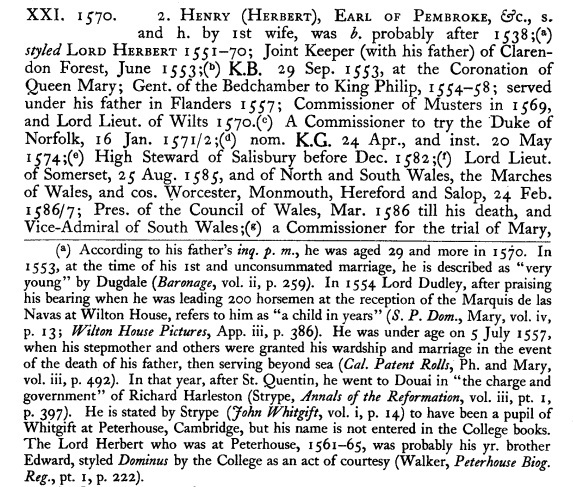 female-line ancestor of Herbert, Earl of Powis (of the second creation in 1748). 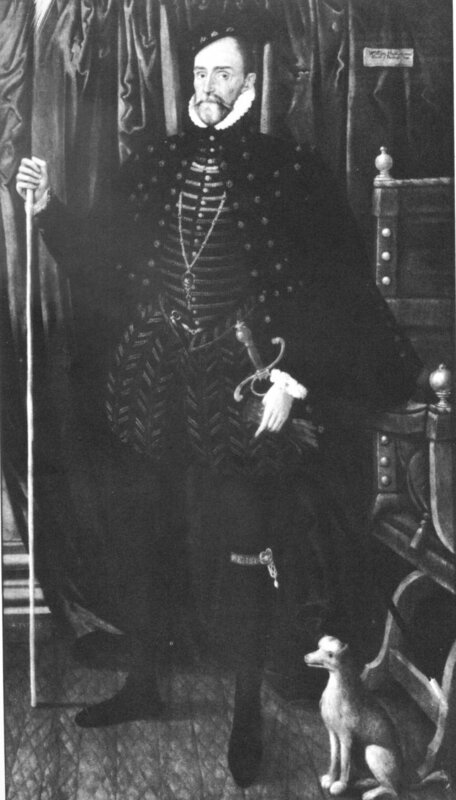 The 14th Earl dressed as the 1st Earl, "after a painting by Hans Holbein the Younger". Photo 1897. Note Hans Holbein the Younger died 1543, before Herbert was created Earl. A copy made around the late 19th century by Herbert descendants, the Marquesses of Bute. See full size. From Wikimedia Commons. 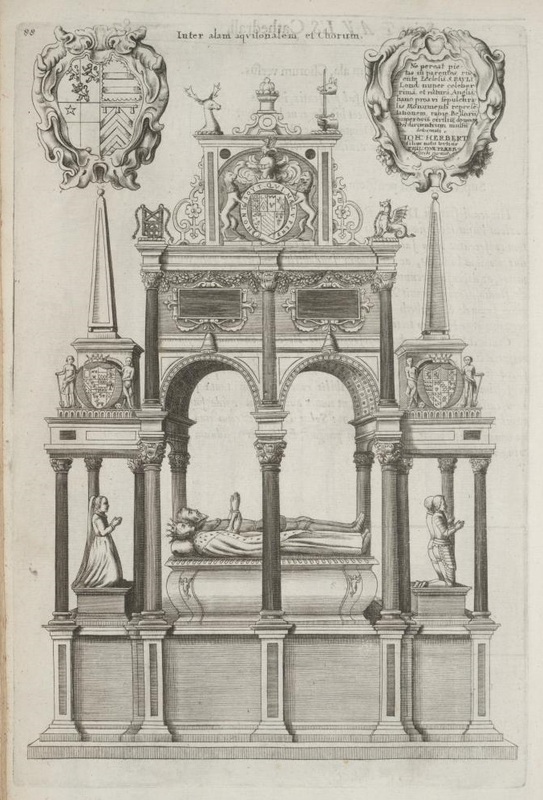 Tomb of William Herbert, 1st Earl of Pembroke (died 1570) and his 1st wife Anne Parr (died 1552). In the old St.Paul's Cathedral, London. The cathedral and the tomb were totally destroyed in the Great Fire of London 1666. 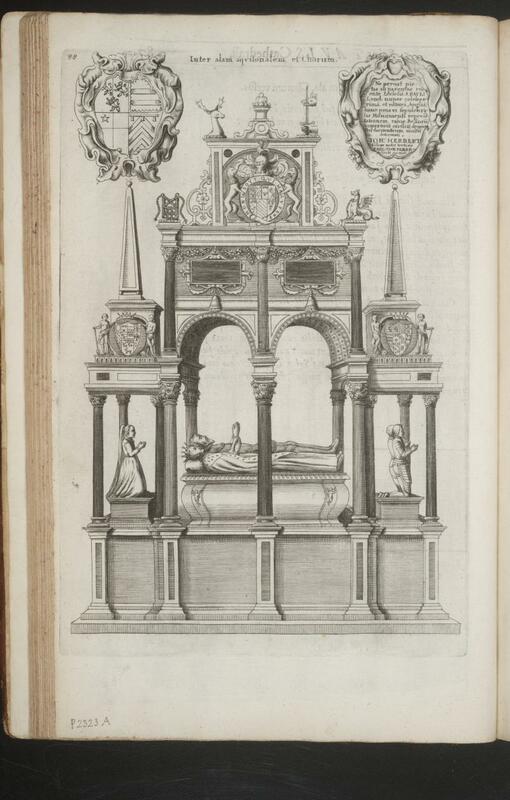 The lost tomb of the 1st Earl of Pembroke, old St.Paul's Cathedral, London. 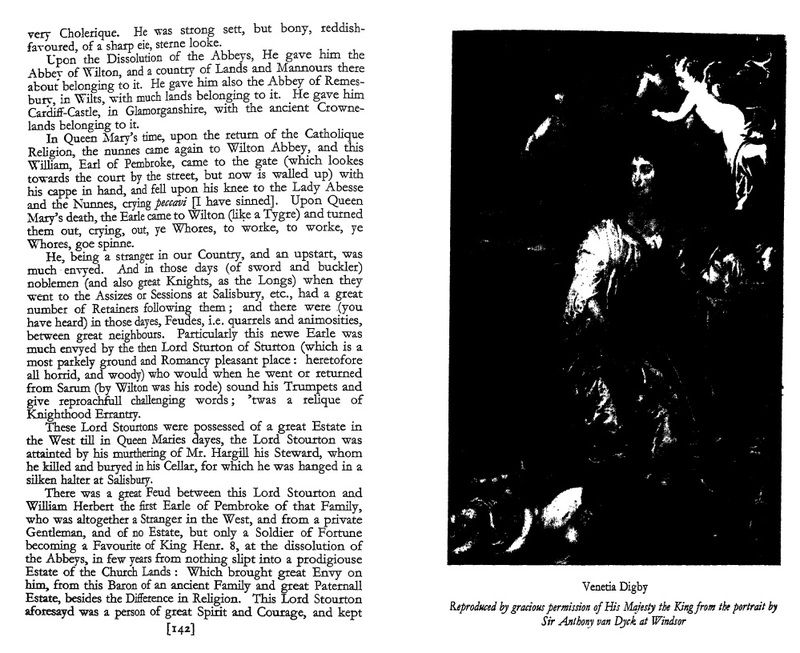 From pp.88-89 (in Latin) of The history of St. Paul's Cathedral in London by William Dugdale, 1658. From Wenceslaus Hollar Digital Collection at University of Toronto. 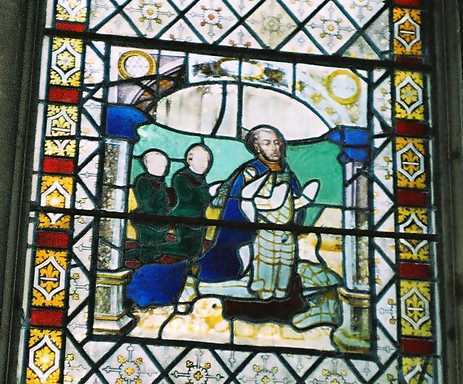 See page and image. See full size. From archive.org above. From p.47 of the book above. List of the tombs lost in the fire of 1666. This is a modern monument in the new St.Paul's Cathedral. Above is the section listing the tomb of the 1st Earl. 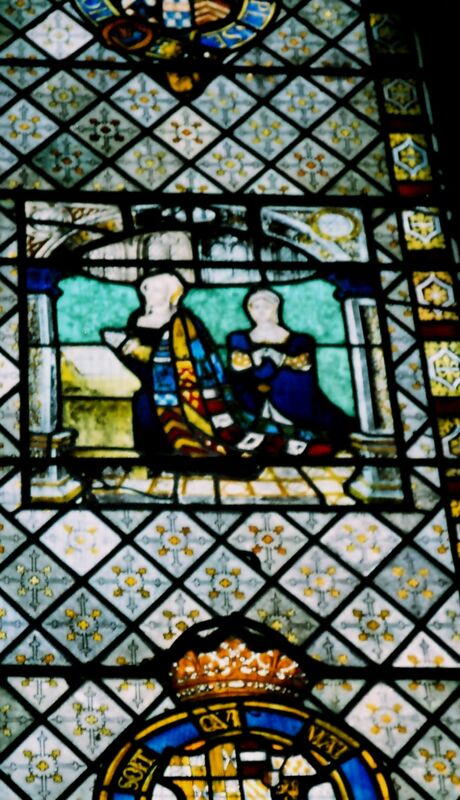 There is a stained glass window, formerly in the old chapel in Wilton House, now in the new Wilton parish church, commemorating the marriage of Queen Mary with Philip II of Spain in 1554 in Winchester Cathedral in the presence of the 1st Earl of Pembroke. 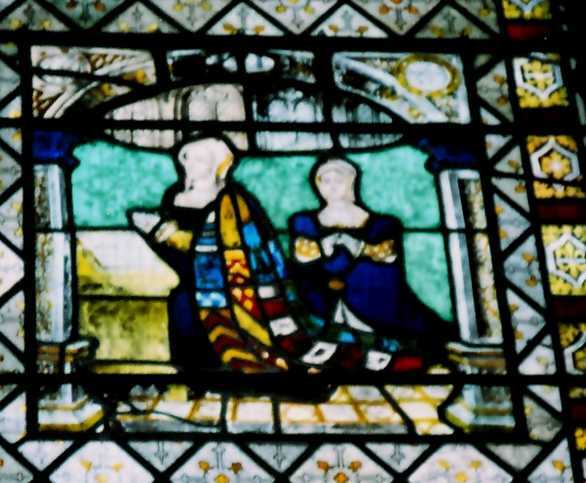 It includes figures of the 1st Earl and his late wife Anne Parr (who died 1552). 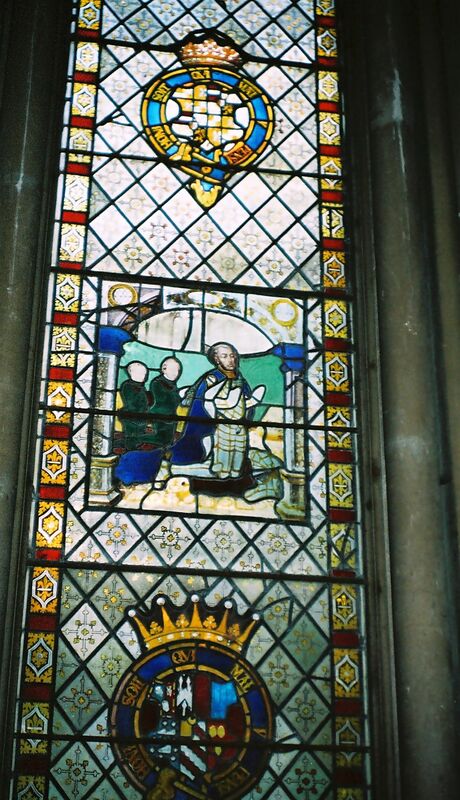 1st Earl of Pembroke, stained glass window, Wilton parish church. The face is a modern restoration. Photo 1999. See larger and full size. From jmc4 on Flickr. Used with permission. Other shot of the above. 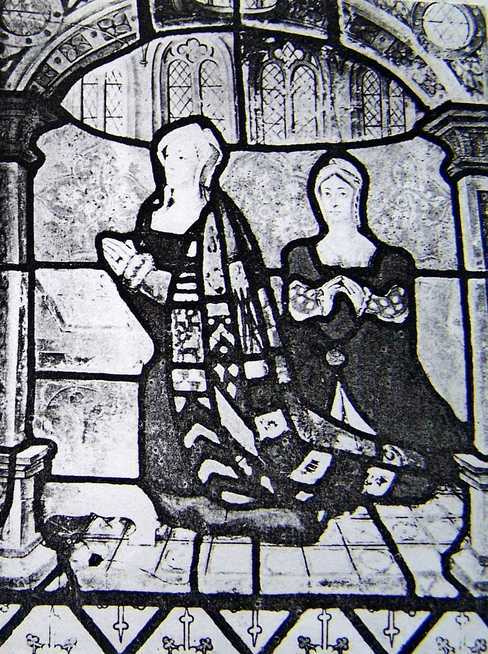 Anne Parr, stained glass window, Wilton parish church.